Two leading lights in the coach tour world, Coach Holiday Group (CHG) and Shearings, are to merge in a deal worth £200m ($376m). The deal will form one of Europe's largest coach holiday firms - WA Shearings - with a combined annual passenger load of nearly one million. Under the deal, venture group 3i will own 68% of the firm, while the rest will be owned by employees. The planned merger is subject to approval by the Office of Fair Trading. 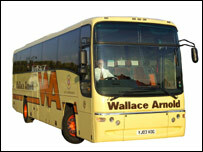 CHG is the parent of holiday groups Wallace Arnold and Caledonian Travel. Shearings has 2,500 staff and operates a fleet of 226 coaches as well as 36 hotels. CHG's Wallace Arnold is slightly smaller, with 1,000 staff, 215 coaches and nine hotels. The combined entity will generate sales for 2004 of about £216m and operating profits of £14m, giving the group a 14% slice of the UK coach holiday market. The merger comes six months after Shearings abandoned plans to float on the Alternative Investment Market, blaming a poor climate for new issues. The new company plans to target the affluent and growing over 55 age group by offering a choice of coach and air holidays to more than 170 destinations in the UK and Europe. It says it will partner with other tour operators to provide long-haul trips to destinations such as Canada, America, Australia and New Zealand. CHG chairman Bernard Norman dismissed fears of large job cuts. "We will not be planning large-scale job losses, as is often the case with mergers," Mr Norman said. Instead, he said, the "vibrant and ambitious enlarged company will offer employees increased opportunities".